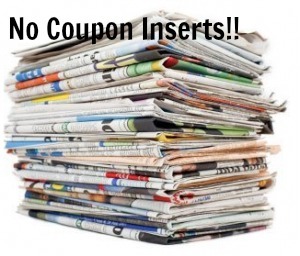 Hopefully through the reading of other deal matchup blogs you all got the message that we weren’t going to be getting coupon inserts in yesterday’s paper. I personally welcome weekends when there are no new coupons issued. It gives me something of a break and leaves me ready to clip to my little heart’s content the following week. I have to say though, I am really disappointed with the sale offerings at CVS and Walgreens this week. After looking through the matchups on KrazyCouponLady.com this is what I was able to come up with…. Kinda sad, I know. After looking through the Walgreens ad online, there were a few more deals I thought I might pick up ~ but nothing to get too terribly excited about. So, with all of that being said…..I’m not sure if I’ll be shopping this week or not. But I still encourage you all to search the deal matchups to see if there’s anything your family needs.